Often remembered for his impassive demeanor and cold frugality, Coolidge finds himself in friendly hands with Shales. From the book’s outset she is clearly embarked upon a mission to reinvigorate his legacy and remind a financially stretched nation of his careful fiscal stewardship. And in Shlaes’s view Coolidge is more commendable for what he did not do as president than for what he did. This 456 page biography is extremely well researched and jam-packed with information. But Shlaes is not as gifted a biographer as investigator. Her narrative exudes an uncomfortably disjointed quality as it bounces from topic to topic, rarely taking the time to draw connections between disparate threads. Important facts and events are often described with the same intensity as trivial ones, and she rarely reviews key points to ensure they have been absorbed by the reader. Fans of linear chronology will appreciate Shlaes’s steady, careful journey through Coolidge’s life. But it usually feels more like a rigid march through his appointment book – punctuated by revelations regarding Will Rogers, cheese making, or perhaps aviation – than an dexterous exploration of his character. And despite the book’s hefty size, and its penchant for detail, much is left unsaid or under-analyzed. As a review of the social, economic and political currents of Coolidge’s times this biography is often excellent. Shlaes provides a backdrop to Coolidge’s story that is rich with context and demonstrates her understanding of the era. And yet her biography feels surprisingly sterile, detached and devoid of vibrancy. Neither Coolidge nor the characters surrounding him ever feel like real people. Readers quickly discover that Shlaes’s politics (or, more precisely, her economics) are frequently on display. Fans of dynamic budget scoring will applaud her cogent arguments in favor of Coolidge’s tax policies. Unfortunately, the axiom that lower tax rates lead to higher revenues is asserted once too often causing this to feel like a policy paper at times. But in nearly every respect Shlaes proves the perfect advocate for Coolidge and his cautious, conservative approach to government. Amity Shlaes’s biography of Calvin Coolidge is at once disappointing and meritorious. It punctures tired, shallow Coolidge caricatures and yet fails to offer a thorough or engaging study of his character. It is replete with context and interesting tidbits and yet lacks many of the qualities of a superbly-written biography. In the end, “Coolidge” proves a useful introduction to its subject and a reasoned defense of his policies but falls well short of its full potential. I couldn’t abide this book. As bad as Shlaes’s partisanship for Coolidge was, she really crossed a line in chapter 15 when she flat out misrepresents his response to the bull market. I’ve never seen a falsehood that glaring in a biography before, and it reflects either an ignorance of her subject or a deliberate attempt to cover up his responsibility for the depression. I have to disagree with your critique for a few reasons. Coolidge’s personality comes through in her book. She highlights some insightful points that are reflected in history. She spends a considerable amount of time on Coolidge’s dislike of and disagreement with Hoover, proven by history to have been a poor choice as President despite his years of education. Also, and more interestingly for present days, is his fight against providing veterans care, concerned about the burden it would create and the creature into which it would grow. Given the gravity of the problems, providing some kind of support and care for our veterans in the 21st century is essential, but veterans health care is a mess and has always been a mess. Thanks for your comments – I always enjoy hearing how opinions differ on things I’ve read. In this case, while I appreciated Schlaes’s efforts to demonstrate Coolidge’s competencies (and prescience in a number of areas, as you point out) I thought her narrative could have been more engaging and her analysis/insight more robust. My expectations (based on what I had been told by other who had previously read the book) may have been unreasonably high…but other modern bestselling presidential biographies have captured my attention more vigorously and left a deeper impression on me. This is a detailed book that still left me with some questions about what drove Coolidge, who is a much less interesting character in Presidential history that his successor, Hoover. He seems to be one of the better accidental Presidents, who were thrust into office as VPs after a death. But times were prosperous so Cal wasn’t really tested in the same way as LBJ (Vietnam) or Truman (ending WW2). And I agree that Shlaes lays on the economic policy a bit thick. 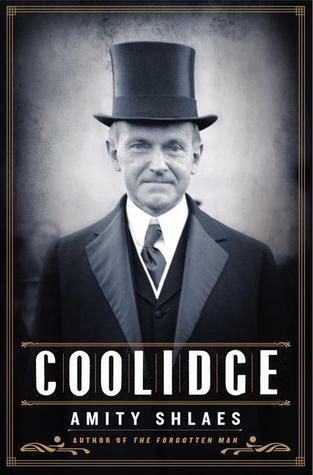 I absolutely loved this book, Coolidge being a favorite of mine. But I do agree it’s more of an infodump than a story. Good if you’re into that sort of thing but I can see how it could turn off some. BTW this is my first comment. I just recently decided to do a similar project with all of the presidents and it led me to this site. I must say I’m blown away by the amount of work you have put in and I will definitely be using this as a resource. Keep up the great job! Good luck on your own presidential project – if you start a site, let me know so I can add it to my “related links” page. And even if you don’t, please let me know when you come across something that blows you away (or that you really disliked)!